Home Ministry Leaders Where Do You Go When You Have Lots of Small Group Questions? It was about this time 20 years ago—the fall of 1995—that I started a new ministry from my basement in Cincinnati, Ohio. For a couple of years I had considered developing a national magazine for small group leaders, and I even had an offer from the preeminent small group ministry of that time to publish it—in due time. As I prayed and planned and talked about the idea with some friends, one of the guys in my men’s group asked why I didn’t just put the content on the World Wide Web. So, using my dial-up modem and a computer measured in megabytes rather than gigabytes, I got started, registering the domain name smallgroups.com (oh how I wish I had also registered .org and .net as well as all the variations: smallgroup.com, etc.). God took the small seed and grew it and multiplied it and overwhelmed me, so much, in fact, that I eventually partnered with others to take it over and help it continue to grow. Today that little ministry is operated by Christianity Today and is being overseen by Amy Jackson, who continues to be used by God to provide resources to help groups develop disciples who make disciples. That was my dream 20 years ago, and today it’s going stronger than ever. I’m honored today to have Amy share her story and thoughts about how we can continue to resource group leaders worldwide. GUEST POST by Amy Jackson, Managing Editor of SmallGroups.com, a ministry of Christianity Today. Follow her on Twitter @AmyKJackson. I have always loved to learn, and bookstores have always been a favorite place of mine. Years ago when I was hired by a church to start their small-group ministry, I approached it the same way I did everything else: I plopped myself down at the local bookstore and read all I could. After a few hours, I had a few new ideas, and I bought the best book of the bunch. But within a few weeks, I realized that my questions weren’t fully answered. Yes, this new book had given me an overview of small groups, but I still had a lot of questions about the specific things I was working through. So I headed back to the bookstore, looking for a more specific book on my most pressing ministry questions. The problem is that books simply couldn’t dive deep enough into the specific questions I had: What do I do about the existing Sunday school classes? What exactly should new leaders know before they start leading? What are the best ways to connect people into our new small groups? And perhaps my biggest question: How in the world can I take the principles of these huge churches and make it work for my church of 300? Soon I found myself turning to online resources that addressed my specific questions with tips. Rather than spend hours at a bookstore searching for a book that might answer only a few of my questions, I could now look at a specific training tool for a few minutes and find the answers I needed. There is still value in reading books about small groups! Some of my favorites are Leading Life-Changing Small Groups, Community Is Messy, and Life Together in Christ—and I highly recommend them all. But when you need to know how to troubleshoot a problem, you don’t have time to wait for a book that may or may not have an answer—in this case, even Amazon’s speedy shipping isn’t fast enough. Besides the benefit of immediacy, the Internet has also helped small-group ministry leaders by allowing a variety of authors to publish and share what they’ve learned. One of my favorite things to do as editor of SmallGroups.com is find unknown small-group pastors around the world and share their wisdom. The only people who get book deals are people with large platforms, but there are lots of other people with hard-won wisdom to share. Online publishing allows a multitude of voices to be heard—and that benefits everyone. 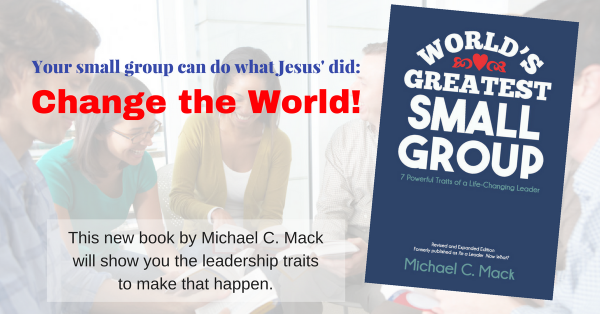 I love the possibilities the Internet has opened up on for small-group leader resources. We can easily find just the right training from knowledgeable people around the world and access it immediately. We can stream videos on our TVs, and we can purchase a Bible study for our group tonight and still have time left to prepare for our meeting. I’ve felt the pain of being in ministry and needing answers fast, so I love being able to provide valuable resources for small-group pastors to access right when they need it most. I’m overjoyed to connect with small-group pastors around the world to learn their proven techniques and best practices, packaging them in a way that allows leaders to instantly access high-quality training in whatever way makes sense for them. I’ll always have a special place in my heart for bookstores, but the ever-widening resources on the Internet have the unique ability to meet specific needs—and that has the power to change our small-group ministries for the better. Managing Editor of SmallGroups.com, a ministry of Christianity Today.